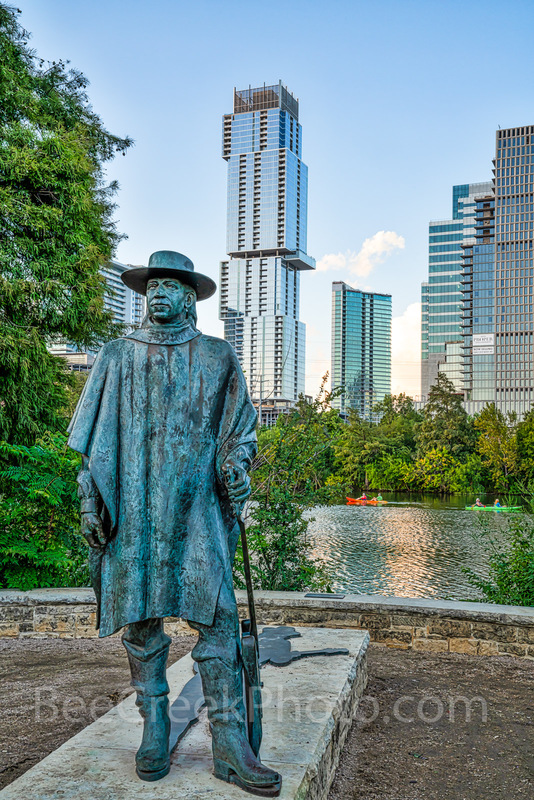 Austin Stevie Ray Vaughan Statue - Stevie Ray Vaughan bronze statue along Lady Bird Lake from the Butler hike and bike trail as he stands with the newest high rise behind him the Jingle or Independent condo skyscaper. The Independent was recently added to the Austin skyline. There are so many new high rise buildings it too many to name these days and two more are on their way. Stevie had a special place in Austin he played his style of blues and rock and roll in many of the clubs here in the 70 and 80s until his death on August 1990 in a helicopter crash. Probably help Austin create their history of music captiol of the world slogan. In any case he has been missed and many leave flowers and other mentos at his statue. Photo © copyright by Bee Creek Photography - Tod Grubbs / Cynthia Hestand.